The style of Hotel Plaza aimed at retaining as many of the original features as possible. The family had owned it for some 120 years and there were plenty of photographs on the walls to illustrate the point. This included the doors to our triple room which had however a very modern lock. Last night Ian struggled a bit to lock the door and this morning neither Ian nor Cliff was able to unlock the door. And so it was that this morning, a small Mexican, sombrero and pointy boots and all, climbed in through our bedroom window, greeted me and after some fiddling with the lock succeeded in opening the door. Who said it was easy to get breakfast! 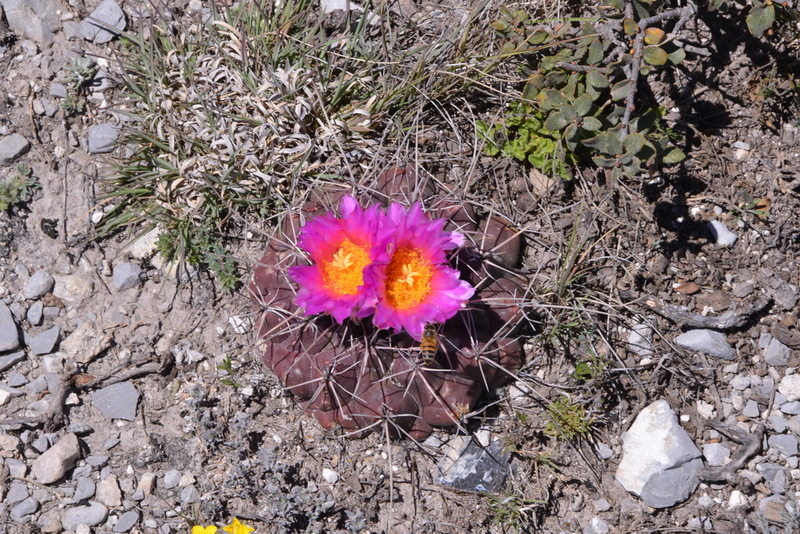 We headed north on Ruta 61 and decided after a while on a leg stretch stop (S3062) that provided us with Thelocactus rinconensis or was it T. buekii? Opinion remains devided with T. rinconensis a possible candidate? As usual any name labels had been removed from habitat, possibly taken back to the shop to have the latest ID opinion written on them. 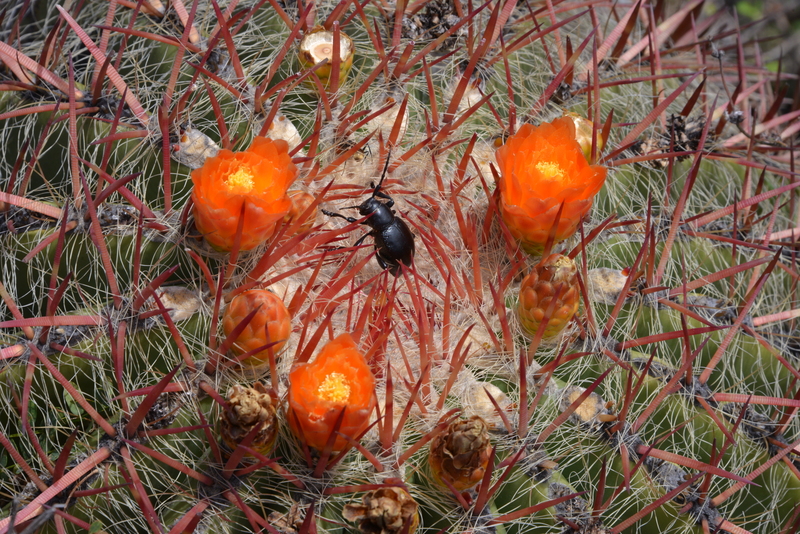 There were also some sizeable clumps – or rather, multi-stemmed groups of Ferocactus pilosus with crowns of flowers – quite small for the size of the plant. Another leg stretch stop along R61 was prompted by T. buekii in flower – gorgeous plants! 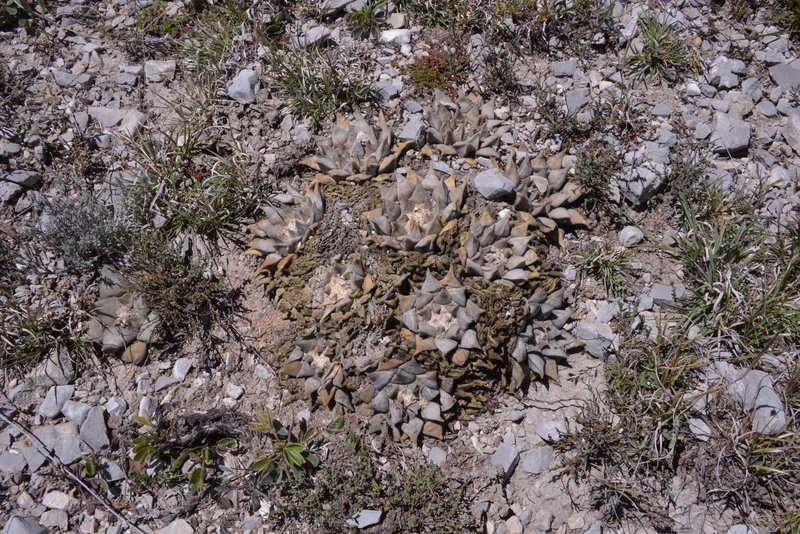 Our target stop of the day (S3064) was a small hill, just north of La Ascención (Aramberri, Nuevo León), that I visited first with Eunice Thompson on 3 March 2011, when conditions were much more arid than today and the plants (T. buekii and Ariocarpus retusus, plus others – see plant list for 3 March 2011) were very dehydrated. 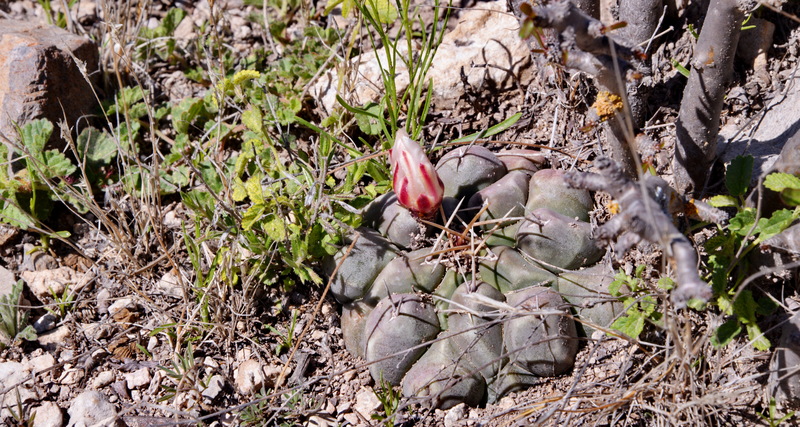 Today the low hill was awash with field flowers and pumped up cacti, after recent rains. Most of the Thelos were in flower or in bud. I made myself a promise to come back one year in late September / early October to catch the Arios in flower. I entered the coordinates of the location for our 2011 stop for Geohintonia mexicana and Aztekium hintonii in and was about to enter the coordinates for the exit from the 61 when SatNav seemed to have this already. We were ahead of schedule, so we allowed ourselves to be (mis)guided. SatNav took us to the village of Iturbide which had some hotels. We booked ourselves into the Pousada and hit the road again, being guided up a very narrow but very steep track. This looked completely unfamiliar to me, yet at the same time there were familiar features suggesting that we were in the right area, if not the right place. Around the hamlet of La Providencia, SatNav lost the plot. ‘Now walk for 5.2 km to the south west’ Yes, right, over a massive ridge of hills into another valley. We decided to drive on a km or so, then parked the car where some narrow canyons met the road. Cliff and I took one, Ian another and soon found large unfamiliar Thelocacti hanging from the steep cliff walls. The make up of the cliff walls was similar to what I remembered from the Geohintonia and Aztekium locations in 2011. But what was the Thelo? Back in the Hotel in Iturbide, I looked at the excellent website http://www.thelocactus.cactus-mall.com/ by Alessandro Mosco and it seems that the Thelos we had seen today could all fit within the concept of T. buekii. Or could they? there was a smaller Thelo growing on the opposite canyon wall that was a much darker green. More reading I think. We’re spending the night at the charming Posada El Carmen in Iturbide – clean, safe and quiet except that this morning (Saturday) they are setting the market square up for a party. 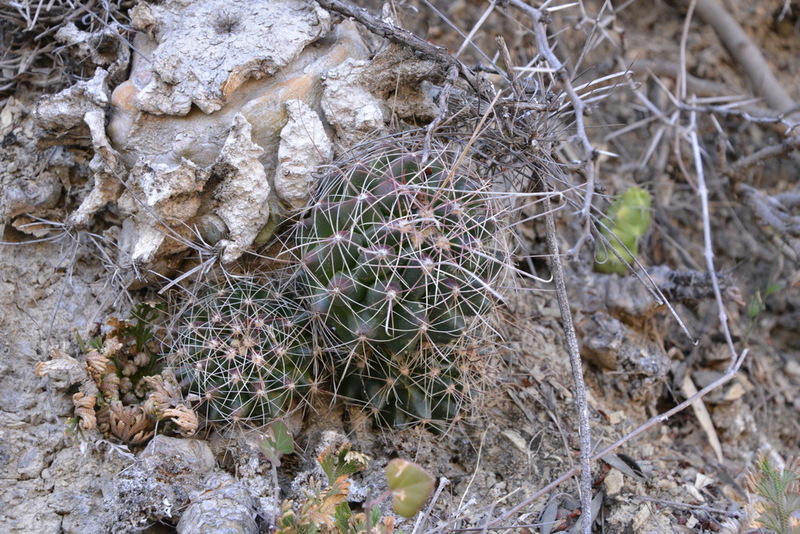 Agave lechuguilla, Echinocactus platyacanthus, Ferocactus pilosus, Mammillaria sp., Mammilloydia candida, Neolloydia conoidia, Opuntia sp, Thelocactus sp. 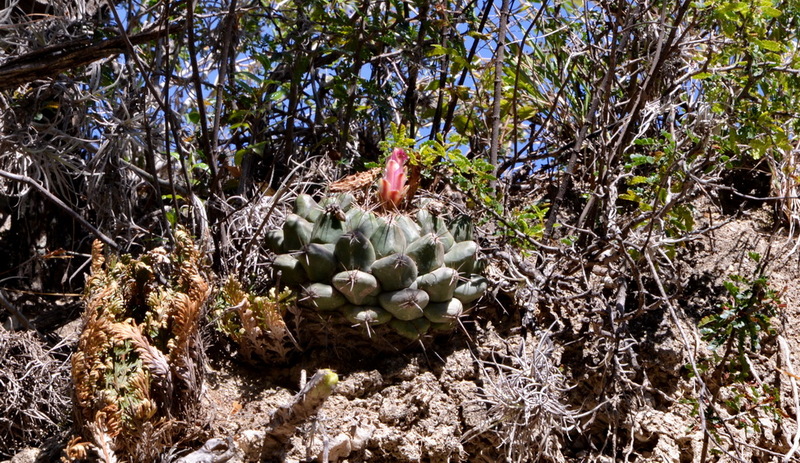 Yucca sp.